Last week, in a moment of enlightened and inspired teaching, a Social Studies teacher at Haverford Middle School in White Plains, New York decided to bind the hands and feet of two black students. She then placed these two young girls under a table in an effort to evoke the horrors of the Middle Passage. Quite predictably, this incident has been the focus of much outrage and anger. The parents of the two students are upset because their children were humiliated. The local chapter of the NAACP is urging action because this teacher's actions reek of racial insensitivity. Pundits, critics, and other observers are disturbed that the teacher has not been dismissed. Not surprisingly, to the school board and the teacher, what happened was a "simple misunderstanding." In hindsight, the fact that a white teacher would feel empowered to bind the hands and feet of two black children in a reenactment of slavery is not surprising. Every year, at colleges and universities across the United States, we witness a predictable parade of "Crossing the Border," "Hip Hop Gangsta'," and "Ghetto Thuggin'" parties. In the latter two events, white college students perform a spectacle of "authentic" "blackness" where they don black face, drink from 40-ounce malt liquor bottles, and cathartically exercise, through a perverse type of wish fulfillment, their imagined understandings of "black" personhood—a range of humanity conveniently reduced to the stereotypical binaries of either being "ghetto," or "gangsta." 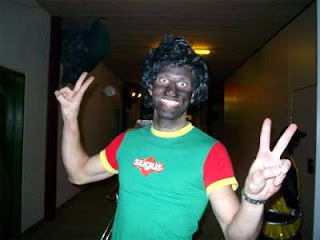 While at other events, these same often privileged and entitled white students crawl under barbed wire and "cross the border" to enter "Mexican" themed parties, where in costume these students drink tequila, dance to "Hispanic" music, and perform their own versions of brown face minstrelsy. Collectively, under the guise of celebration, these parties reflect the particular ugliness of a twisted white supremacy, mated with a deep racial bigotry. While the teacher at Haverford Middle School incident would reject any comparisons, she and the students who host and attend these nouveau minstrel parties share an important trait: a profound lack of empathy and sympathy for their fellow citizens, generally and for people of color, specifically. As we reflect on these incidents, I would suggest that this collective lack of empathy and sympathy should be the primary focus of our shared offense (as opposed to some general sense of protest) because in an age of color-blind and ostensibly "post-racial" politics, racial inequality is given life through a politics of benign neglect and an unwillingness to relate in a deep and meaningful way to one's fellow citizens across the color line. For example, the Social Studies teacher at Haverford Middle School who symbolically transformed her two students into chattel for the purposes of a teachable moment chose not to reflect on how her actions could damage the self-esteem and psychic well-being of the students in her class. She also chose not to ask herself how it would feel if her sons or daughters were placed in a similarly untenable situation. Likewise, the college students who participate in these 21st century minstrel parties also make a convenient choice that avoids critical self-reflection. Akin to the teacher above, the college students in question remain the subject. Accordingly, they do not imagine themselves as the object of these crude acts. Because of their lack of empathy and sympathy, the parties to these incidents also shift responsibility to the victim. To them, the real evil is a hypersensitivity to racial offense on the part of the aggrieved parties. Predictably, this reversal will involve a common appeal to "playing the race card" where race and racial animus are injected into these incidents, as opposed to being present in the forefront as necessary and sufficient conditions. This transferal of responsibility to the victim, to the object of this bigoted behavior, is one of the primary ways that a lack of empathy and sympathy functions between individuals and across communities. In total, it immunizes individuals from responsibility and a sense of communal obligation. As noted legal scholar Lani Guinier and others have argued, we need to move beyond a rationale where individuals see it as politically expedient to ignore the struggles and needs of their fellow citizens. Moreover, I would argue that to overcome the economic, social, and political challenges presently facing the United States we must, and in fact should, move beyond being strangers to one another. Ultimately, these trying times necessitate a sense of shared empathy and linked fate. It is ironic that despite the poor judgment involved in the slavery reenactment at Haverford Middle School, this incident remains a teachable moment. Through forcing a reconsideration of our relationships to others, we can grow and ask ourselves, "What if those were my children? If so, how would I feel?" "If I were a child and treated so callously, what would be the effects on my emotions, heart, and mind?" From this beginning, we can move forward to other questions: "How would I feel if those were my children struggling to achieve in a poor or under-resourced school?" "What would I do, if it were me, instead of my neighbor, who lost his or her job?" "How is the fight for a living wage, also a fight for my standard of living as well?" "What would I do if I were homeless? How would I help myself?" "Who would help me?" "How would I feel if the United States government prohibited me from loving and marrying whomever I so chose?" Some would likely object that power makes one immune to a sense of shared sympathy and empathy—that those who benefit from that en vogue, increasingly empty, catch-all phrase, "white privilege" cannot understand the racial Other. Maybe more generally, the powerful will not and cannot relate to the less powerful, the outsider. Indeed, perhaps we are in fact victims of historical myopia and are doomed by a limited capacity to empathize with our fellow citizens. Certainly, we do not live in a post-racial moment where race no longer matters. Undoubtedly, race still does real work in structuring our life chances—and it will continue to do so long into, and after, Barack Obama's presidency. However, as Obama's victory demonstrated, economic self-interest trumped racial prejudice for some voters. If we are lucky, perhaps this "enlightened" self-interest will counter-intuitively push us closer to finding a set of collective solutions to shared problems. The teacher is not white she is a Jew. Get your facts straight. Great overview of this issue, thank you. Anonymous, in America Jewish people ARE white (unless they're Sephardic). Get YOUR facts straight. It is funny how the "she is a Jew" comments and similar protestations disguise so much hostility and bigotry.